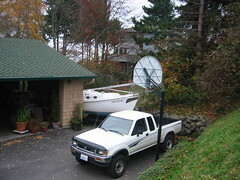 Positioning my 23 ft boat beside the garage is somewhat of a delicate feat. Last year I was able to do it with a stressed out wife and patient teenage sons. This year I decided to do it with a little more finesse- I bought a come along. Everything worked like a charm, and the boat is safely stowed away next to her sister and out of sight.